Abu Dhabi 21 July 2018: Etisalat, the official partner of Special Olympics World Games Abu Dhabi 2019, which will take place from 14-21 March 2019, joined the world on July 20 in celebration of Special Olympics' 50th anniversary to work together to create a new future for People of Determination. Etisalat's headquarters in Abu Dhabi and Dubai Al Kifaf buildings were among a number of major landmarks and iconic venues around the globe that lit up in red to celebrate the Special Olympics movement. ‘Light Up for Inclusion' is a global demonstration of tolerance, respect, and celebration of difference. 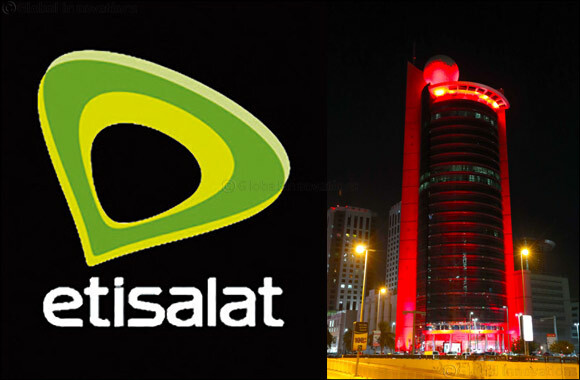 By lighting up in red, Etisalat hopes to help bring awareness for the inclusion of people of intellectual disabilities. Etisalat's endeavour to be at the forefront of international major sporting events and works towards fulfilling our responsibility to support world-renowned initiatives that benefit People of Determination. It is a key element of Etisalat's corporate social responsibility strategy to provide equal opportunities to all - especially that sport is a right and must be accessible to all throughout the society.